Photography should not be sold by the pixel. Images are not the same as selling sugar by the pound. Yet, as if the stupidity of Getty's $49 imagery wasn't enough (more on that here), Getty Images is now selling images by pixel dimensions. 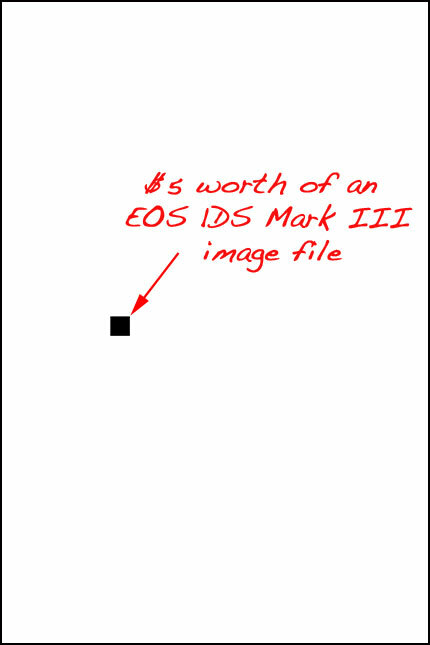 To give you some perspective - below is the full frame dimensions of a file from a Canon EOS 1DS Mark III. Then, in black, is a 170 pixel by 170 pixel box, representing what Getty Images will license for $5 if it's a royalty-free image, and $15 if it's a rights-managed image. All this, and more, can be discerned from the Getty Images site, here. It's been just over a year since Getty announced the completion of their being acquired by Hellman & Friedman (here), and there has been little good in their press releases about Getty Images proper, and a lot about deep-and-cheap deals with Flickr, JupiterMedia, and now this. Oh, and don 't forget all the layoffs and office closings. Look in the coming year for H&F to start shuttering underperforming divisions and quietly looking for buyers of the more profitable divisions. Heck, with Google trying to grow their news offerings, maybe Getty Images' news photographers will begin seeing "/Google News" after their names in the not too distant future? Whatever Gettys' future holds, pricing by the pixel is just sheer idiocy. If a man is called to be a street sweeper, he should sweep streets even as Michelangelo painted, or Beethoven composed music, or Shakespeare wrote poetry. He should sweep streets so well that all the hosts of heaven and earth will pause to say, here lived a great streetsweeper who did his job well. Today, on assignment in Disney's California Adventure, I witnessed this first-hand. 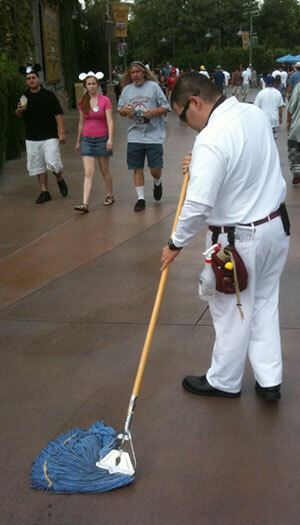 The gentleman I photographed here fit that charge to a T. I watched as he mopped the concrete walks. A stubborn stain he spritzed with his spray bottle, and his holster held other tools necessary to do the job as if he were Michelangelo. He even cared about his appearance as he was doing it, and he also worked during lulls in the crowd so his moping didn't interfere with the parks' guests. I watched for awhile, impressed by his overall approach as well as the details he cared about. Next is Rutger Hauer, who played Roy Batty in one of my all time favorite movies Blade Runner. "The light that burns twice as bright burns for half as long", a reference to Roys' longevity and impending death. Last up for the day is the tortise and the hare, and that tale of slow and steady over fast and corner cutting is a well known tale. These and so many other parables are guideposts to a future of success in this field. In photography, there are no real short-cuts to success. Yes, there are lucky breaks, yet often, those that experience those do not have the foundations laid for continued success, and often falter. Yes, in a short period of time you can be covering important people doing important things, but if doing so means giving up your rights to your images as a freelancer, or accepting a pay structure that is unfair and non-sustaining, then, as with Roy Batty, you may "burn twice as bright but half as long" and you'll flame out. Returning to the street sweeper - if you're working for a small paper, a weekly, or doing what some might consider a menial photography-related job, take the sweepers' approach. Do your job well. Earn your respect. Shine brightly as a photographer if you are doing kindergarten snapshots or pet portraits, and you'd rather be photographing CEO's or globe-trotting on an important news story. More than once I've heard of photographers just starting dismiss immediately the notion of working for a small town newspaper, thinking it beneath them and instead believing they were owed a spot at a bigger named publication. Further, far too many photographers believe they are owed something, and that not only should they get a second chance when they screw up, but that they deserve a second chance. They also believe that it is their God-given right to be the next New York Times staff photographer. When you catch your lucky break, if you want to maintain the momentum that the break created, remember this - luck is what happens when preparation meets opportunity. "Licensing News Photos Is Expensive"
Stephen Colbert suggests that a cost-saving effort on his show would be to reduce image licensing, saying "licensing news photos is expensive", and suggests that childs' play would better illustrate some of his stories. Seems like maybe a few microstockers in Pelosi's San Francisco district should be shooting some stock this week and cutting a deal with Colbert, no?